There is a very common reaction when most people find roaches crawling all over their kitchens, their food, or sometimes their entire homes. They grab their credit cards and go out immediately to buy every spray, bait, gel, powder, trap, and poison they can find. People hate roaches, and with good reason. Feeding on unmentionable substances, cockroaches contaminate everything they touch, ruining food, spreading disease, and setting off allergies. Roaches are often the new homeowner’s nightmare. But even the best housekeepers are sometimes subject to invasions of roaches from the neighbor’s place. Roaches will keep on coming even when you have used so much poison that your kitchen cupboards reek of roach spray—unless you take the right steps to control roaches in the right order. 1. Choose your neighbors carefully. If your neighbors don’t keep their roaches under control, it’s very difficult for you to keep your roaches under control. An elderly neighbor who likes to feed cats, or a bachelor or bachelorette who leaves dishes in the sink for days or weeks at a time, or maybe a slightly demented neighbor who never takes the garbage out can provide a breeding ground for roaches that just keep on coming your way. If your neighbor’s place is cockroach heaven, chances are your place will become cockroach hell. It’s always best to make sure your real estate or rental agent does due diligence before you sign on the dotted line. Chances are if you are reading this article, however, you have already past the point of no return with your selection of residence. 2. How to keep cockroaches out of your house? If you provide roaches with a comfortable place to live and plenty of food, you can never get rid of them. The best way to get rid of them is to always seal food in airtight containers, such as ceramic crocks with tight-fitting lids, sealable plastic bins, insect-proof canisters, or inexpensive plastic freezer bags. Put your trash in a container with a roach-proof lid, or take out the trash each and every night. Since roaches like to lay their eggs in piles of dirty clothes or old magazines and newspapers, clear out all kinds of clutter. And clean under refrigerators, under stove burners, and behind the range. It’s even essential to clean a ceramic stove top every day, and it’s certainly essential to clean around burners after spill overs. 3. Close down the cockroach freeway. Roaches move from place to place in your home inside the walls. If they can’t get out of the walls, they can’t contaminate your living space. Plug obvious holes in walls with steel wool. Caulk cracks with silicone sealant. It is especially important to caulk cracks and plug holes underneath sinks in the bathroom and kitchen, since cockroaches gather around water sources. Once you have taken care of bathroom and kitchen openings, inspect and repair the rest of your home room by room. 4. Capture and kill roaches in your living space. Once you have stopped the inflow of insects and blocked off their routes of escape, it is time to catch and kill them. The first products to use are glue traps. Sticky traps will tell you where cockroaches have come in and where they are hiding. The Victor insect traps are poison-free, so be careful when you are inspecting them. Roaches can bite. After you pinpoint roach problems with glue traps, put out roach baits like MaxForce. Baits are slow-acting neurotoxins that are carried back by the roach to share with other roaches. (The larger palmetto bugs are especially social insects that spread poisons far and wide.) The kind of poison used in products such as MaxForce that can be used all over the United States is not toxic to humans, but it is toxic to bees and fish, so be sure to follow directions, and don’t use roach killers around aquariums. 5. Kill roaches where they hide. Once you have roaches under control where you prepare your food and where you sleep at night, then it is time to attack them at the source, inside your walls, and under your floors. What you don’t need to do is to use a product that is toxic to other animals and people. The best product for long-term roach control is diatomaceous earth. Diatomaceous earth is finely ground crystals of limestone. The tiny crystals scratch the exoskeleton of the roach, so it loses water. When a young cockroach molts, shedding its exterior shell so it can grow larger, it is especially susceptible to the abrasive, drying properties of diatomaceous earth. You can use this product to keep little roaches from becoming big ones. Diatomaceous earth is non-toxic to humans and pets, but it is not exactly pleasant. Getting the dust on your skin can itch. The product typically has an off odor. Get “food grade” diatomaceous earth to be absolutely sure you are not introducing any toxins into your home. Remove electrical outlet covers and light switch covers to spray diatomaceous earth inside walls with a “puffer” or powder duster, working slowly so you don’t make the air inside your home uncomfortably dusty. If you have allergies or asthma, it is a good idea to wear a respiratory to prevent inhalation of dried, dusty cockroach parts that can trigger allergic reactions. 6. Give cockroaches birth control. Once your have taken these five basic steps to get cockroaches out of your house, it is a good idea to take some additional steps to keep them out. One way to keep down the population of roaches in your home is to put out an insect growth regulator that will keep the bugs from ever maturing, such as hydroprene. 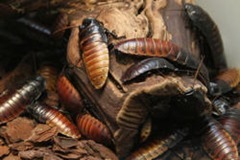 Hydroprene prevents roaches from molting. Unable to shed their exoskeletons, they cannot grow larger, and if they cannot reach adult size, they do not reproduce. The perpetually juvenile cockroaches live out a normal lifespan, but no future cockroaches come along to replace them. 7. Reserve poisons for severe roach problems. Sometimes, through no fault of their own, homeowners encounter roach problems that are simply overwhelming. No amount of good housekeeping and gentle roach control will reduce enormous numbers of insects that making living indoors impossible. In these situations, it is time to consider poisons that wipe out all kinds of insects—when put out around, not in, the home. A roach poison like Suspend forms a protective barrier when applied around your home. (You won’t be able to buy this product if you live in New York, Connecticut, or Rhode Island, but you more often than not wouldn’t have access to the exterior of your home where it is used if you live in those states, either.) The product stays in the topsoil for 90 days, and then has to be reapplied to keep bugs out. The active ingredient in Suspend, deltamethrin, is not entirely safe for people. You must not get the product on your skin, especially through an open cut. It’s also not safe for wildlife, so do not spread it beyond the perimeter of your house, and don’t use it in your home. When cockroach problems are overwhelming, however, the benefits of Suspend outweigh the risks. Before you start investigating the different ways of solving your cockroach problem, it’s helpful to understand roaches and their behavior. Like the old saying “To know your Enemy, you must become your Enemy.” Once you understand them, you are then able to get rid of them, more quickly and easily. Do the plug in pest repellents like Ginny’s actually work? Hi Laura, not for roaches.